When Angelo Comsti, the writer from Yummy Magazine, asked if I would contribute a recipe for their “Guest Chef” feature, the first thing I told him was that I was most definitely NOT a Chef. He said that was okay, they had had non-Chefs featured in the section before… So I did a brief interview, and baked a couple of pili nut cakes (recipe mostly credited to Sister) and brought them to a less than 30 minute photo-shoot and voila!, a wonderful two-page feature in the September issue of Yummy Magazine! It’s a really simple recipe, but a house favorite. Getting fresh pili nuts from some land the family still owns just outside Legazpi is always a treat, and I like to prepare this cake at least once or twice a year, supply of nuts permitting. Pili is such an incredibly underused ingredient in local recipes, and I wish more folks would buy it, bake or cook with it, and eat it. 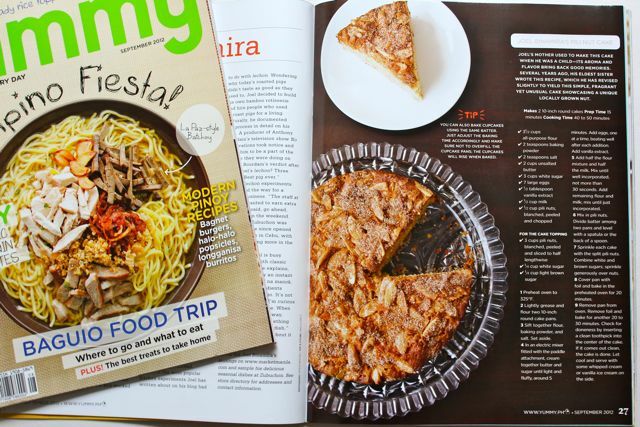 The current issue of Yummy Magazine is “Pinoy-centric”, so I thought highlighting an ingredient like Pili was appropriate. Dang, I’m gonna have to scour Seafood City and the local mom and pop tindahan for this and the other mags. Is the problem with the Pili nut a lack of local demand? If I were to make a guess, it may be supply issue that is at the center of this problem. Pili nuts are quite expensive, closer in price to macadamias at least in the retail level. Cashews are far cheaper and products made from it are more common. In the IFEX trade fair for food exporters, there are some wonderful pili products nicely packaged for the export market. There must be a healthy demand for this product abroad, which could account for the high prices. Lastly, is production truly just limited to the Bicol region? Do typhoons hitting the area have an impact on the Pili harvest? Can it be grown elsewhere? It would be great if we could increase production of this wonderful nut. Congratulations MM! More press for pili! I agree, pili is one of the country’s still-hidden culinary and agricultural treasures. I also hope more chefs would do something with the pili pulp, which most Filipinos are still unfamiliar with, and which I, a Bicolano, can eat everyday for months. i really had fun memories of pili nuts back in HS and college. Our school had a lot of pili nut trees around the school vicinity so during break time, we would go find and cracked its hard shells using rocks we find near the tree. in HS, we did a a project for our applied research subject planting it on different types of soils, unfortunately it was a flunked so we did another one using tahong and bahong as ingredients for our longanisa .on college, we did a pili nut relay race (cracking pili nuts) on one of our Dept. event!!! hay…. those were the days. …	The pili nut cake really look yummy MM, makabili nga ng issue na yan…. :)maybe it can be used also for pesto MM, what do u think? i tried using cashew and peanuts instead of pine nuts and it was a great sub (for me)… thansk MM!!! you’re fast becoming the “king of all media”, MM! hmmmm…”mr. kris aquino”, perhaps? ughh….just kidding! Odessa – that’s a school I would have wanted to be in! Talking about pili shells, do you remember this brilliant enamel-like orange-grown layer inside the shell? If that could somehow be extracted , would it not be nice to use it in furniture or woodcraft overlay? In fact the shell, cut cross-wise ( with a hole in the middle then) might be put to good use by a creative craftsman or designer. I agree! Pili and cashew nuts are great for baking! Cheaper and just as yummy. How I wish I could get a copy of the magazine (I don’t know if it will be available in the US)…and pili nuts are one of my favorites. I just bought the magazine! Funny…I was just wondering what to do with all these pili nuts one of the mothers in school gave me! Thanks for the inspiration, MM, and thanks, Sister, for the recipe. Fell in love with fresh pili the first time I tried them in Bicol! They are truly delicious! Would you know of anywhere we can get a supply of them here in Manila? Isn’t it a shame that we can get imported nuts like walnuts and pecans and can’t get pili nuts?? Urg. Anyway, I’ll definitely be picking up a copy of Yummy soon! i always thought pili nuts should be a big huge export product from the philippines. i wonder why it isn’t. it’s creamy and has a very distinct flavor and can only be found in the philippines. my favorite, it’s too bad it’s so hard to find, especially in the un-sugared state. i bet it’ll be the next “exotic” it-food ingredients in a few months. we used to make some sort of ‘masapan de pili’ from years past. in 3 colors, layered to make a christmas-sy effect. green, red and yellow … > the cover-photo looks like ‘mami-heng’, or is the soup just below the noodles? wow, got both of the magazine really a good one MM reading the one you’ve shared. #10 AM: you can have an e-copy of the Yummy magazine thru Apple Store, bought mine in there lately. Monty, I read somewhere that Pili has a very high fat content, and as a result goes rancid faster i.e. short shelf life. I’ve done my share of nut shopping in bakery supply stores and I sometimes wonder how fast the stock goes. I’ve learned though that if the nuts have spots of white surfaces that are a little powdery – its on its way to rancid. Thanks, MM. Pili Brittle sounds delish! TOTALLY agree about how underutilized and under-appreciated pili is, MM! My sister makes a Pili Pie that our family has loved for years. She has now included it (along with a Pili Crack Pie) in the list of pies that she sells. :-) She’s trying to include more Filipino ingredients in her repertoire, which is why she also sells her Calamansi Pie. Pili really can rival macadamia nuts, and calamansi is just as good as lemons and limes, so it’s a shame that the imported ingredients are much more commonly used in the desserts here. MM, the cake was delicious….it got rave reviews at the PTA general assembly. I added grated lemon zest..just another flavour dimension. Have put my order in for some pili from Bicol…..this cake makes for a lovely weekend hostess gift. Thanks again for the recipe!!! 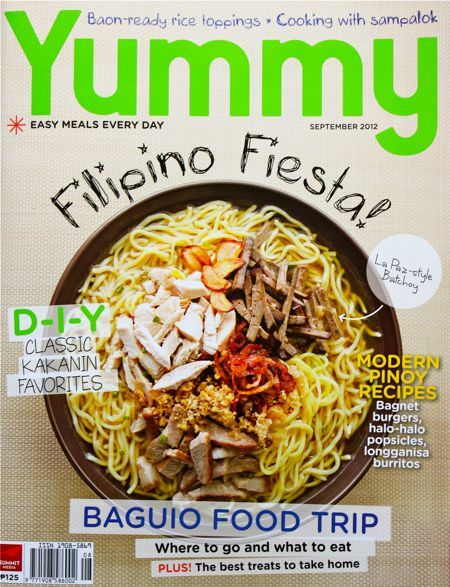 YUMMY mag (Sept issue) arrived today courtesy of a balikbayan friend. Nice, nice picture of the pili cake and the contributor of the recipe.Problem is my sister only sent me 3 packets of the whole roasted pili nut and 3 jars of the candied pili. Wondering if I can use the candied ones for toppings of the cake instead. Oh, by the way, my husband is now headed to Cebu from Bacolod on his way home to Texas. I made sure he stops at any one of the Zubuchon stores and taste the much talked-about lechon and if he can sneak a package of chicharon for me even better. Still the Best Pili dessert of any incarnation is that of Ms. Emma Lacson of Silay. Her Pili Squares are the best decadent, rich morsels of pili nut ambrosia. i really wanted to try this cake but fresh pili nuts are impossible to find here in laguna and it’s uber expensive.. what can i substitute? can pili brittle work or any other kind of pili that is readily available.. thanks! The pili nuts are a very rich, crisp, and delicious nut. I agree with the writer when he says it is a very underused ingredient in Philippine cooking and baking. Right now, what is available in Canada, particularly in Vancouver, are the pili nuts sweet honey flavour. These are the honey glazed / candied pili nuts. I think what is suggested for usage are the fresh or roasted pili nuts. What can be done to temper the sweetness of the cake if the sweet honey flavour pili nuts are used? Or, is the fact that the sweet honey flavour pili nut have been cooked make it ineligible for use as a “substitute” ingredient? Your feedback would be great. In case you have suggestions on how the processed variety such as the sweet honey flavour pili nuts can be used/eaten in some other way aside from being eaten as a snack, such feedback would be appreciated. Islas, no, the candied or sweetened version would probably not work well with this recipe, which is meant for fresh nuts. The candied version has presumably been fried or baked and coated with the sweetened syrup and is meant for snacking. How nice that they are available in Canada now, but I wonder how you handle the rather short shelf life of a nut that has a tendency to go rancid very rapidly. The shipping alone to Canada, unless airfreight, would mean a month or two between production and retail sale. Pili nuts are best within days of preparing them, I find. Of course brittles and candied versions can last a little longer, but the high fat content makes them prone to rancidity. Hi marketman . . . thanks for your reply. I guess you’re right. A sweetened backed nut would not work. As to rancidity, etc., we’ve taken care of that with our high barrier stand up packaging that prevents moisture and oxygen from affecting the crispness, richness, and deliciousness of the nut. And for that reason, our nuts’ expiry is 1 year from its manufacture.